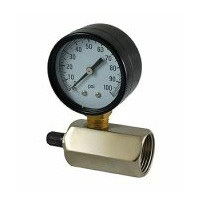 Air test gauge is also called gas test pressure gauge or LPG Pressure Gauge. Its case is mainly made of black steel. Gas pressure gauge can not only indicates the liquefied gas storage capacity, but also can discover whether the leak. Air test gauge is used to measure the pressure of coal gas. Liquefied petroleum gas (LPG) is the air that of colorless and odorless gas. It is the proportion that liquefied petroleum gas weight lighter than air, so often gather in the indoor, and sewage etc. If it is mixed with air and get to an explosion limit, that can be very dangerous when meet fire for explosion can occur. So that the leakage of a gas pressure gauge (LPG Pressure Gauge) is very important. Timely detection of leakage to prevent accidents is crucial. In daily use which required in the relief valve with gas LPG pressure gauge. Domestic liquefied petroleum gas leakage for angle valve seat sealing or stem seal damage; reducing valve angle valve connection is not tight or seal damage; rubber tube aging, cracking or too loose; cooker rotating core sealing, such as the causes have been excluded, may be the cylinder leakage. Gas LPG Pressure Gauge now plays a very important role. Ma Anshan Exact Instrument Co., Ltd is a professional manufacturer of all kinds of LPG pressure gauge instruments. Our company specialize in designing and manufacturing bimetal thermometer, air test gauge and water test gauge, hot water thermometer, refrigerator gauge, CNG pressure gauge, industrial thermometer, safety pattern gauge, case, movement, pocket, connection and so on. Our products are widely used in oil, chemical industry, metallurgy, electricity, manufacture, papermaking, food, energy, etc. Our products have been exported to U.S.A, Canada, Europe, Spain, Egypt and South-east Asia, mid-east and so on. Process GaugeIts outer shell is made of phenolic, while its internal part is made of stainless steel. It's used for processing food and refrigerating and other engineering territories. Process gauge is easily adjustable with the self-locking micrometer pointer. Its socket is date-coded to ensure pedigree. And there are wetted parts printed on the dial.